Bastet is the Ancient Egyptian cat goddess of war, fertility, cats, child rearing, and protection. Originally, she was named Bast (or Ubasti). The name later evolved into Bastet, a diminutive form that has a more feminine connotation. Bast is mostly depicted as a woman with a cat's head. However, she's also been depicted as a regal and fierce desert cat. Indeed, cats were considered Bast's sacred animals and any act of violence or disrespect against a cat was considered a direct offense against Bastet. Archaeologists have found ancient statues and statuettes depicting Bast. Many of these statues show Bast wearing elaborate scarabs, nose rings, necklaces, and opulent breastplates. Bast had two distinctive yet opposite aspects: On the one hand she was the motherly goddess of fertility and child rearing. She was also known as the lady of perfumes and secrets. On the other hand, she was the fierce protector and avenger of pharaohs and devotees. Bast was worshiped as early as the Second Dynasty (around 2890-2686 B.C.). She was considered a solar goddess. According to legend, Bast was the daughter or Ra, the Sun God. She was considered to be one of Ra's avenging deities. Bast was also believed to be the protector of the pharaohs. Later, the Greeks would change Bast – known to them as Aelorus – into a moon goddess as they came to associate her with the Greek goddess Artemis. Bast's importance in the Egyptian pantheon decreased somewhat after the rise of Sekhmet, one of the other Egyptian feline goddesses. Many experts believe that Sekhmet's ascendancy grew after the consolidation of the Lower and Upper regions of Egypt and as such she became a more prevalent deity. Sekhmet was seen as a more universal deity. By contrast, Bast was more dominant in Lower Egypt. Some scholars say that Bast - and later Bastet - means female devourer and goddess of the ointment jar. Not surprisingly, to Ancient Egyptians Bast was also the goddess of balm and perfumes. Incidentally, Bast was regarded as the consort of Anubis, the god of embalming. Being a solar goddess, Bast was also known as The Lady of the Flame and The Eye of Ra. She was also referred to as The Lady of the East. Bast was regarded as the protector of Lower Egypt and pharaohs and as such she was portrayed as a ferocious lioness. She was also the cat goddess of the city of Bubastis (also known as Per-Bast and Tell-Bast), where she had a temple devoted to her and her sacred cats. The city of Bubastis was named after Bast, whose original name was Ubasti. Bubastis was situated in the Eastern Nile delta region. Ancient carving of Bastet. Outer wall, Temple of Horus at Edfu, Egypt. Bast has been a constant source of inspiration for artists throughout history. She not only makes appearances in Egyptian hieroglyphs and papyri, but she also appears in more modern works of art as well as popular culture. In Ancient Egypt, Bast graced amulets, jewelry, talismans, statues and even mirrors. 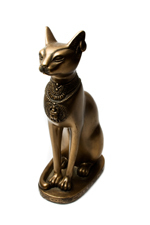 Nowadays, you can find Bastet-inspired paintings, statues, figurines, posters, and other collectibles. You can also find Bast-inspired charms and necklaces. The cat goddess has also inspired a comics’ character. Indeed, she is the protagonist of Marvel Comics’ Bast. The goddess Bast is also mentioned in the books Garfield: His 9 Lives (based on characters and stories by Jim Davis) and The Three Lives of Thomasina by Paul Gallico. She’s also the inspiration of the novel Per-Bast: A Tale of Cats in Ancient Egypt by Lara-Dawn Stiegler. By the way, if you or your cat-loving friends love reading, below is a list you may find interesting. 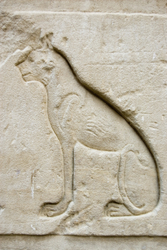 And for more about Egyptian cats, check out this article.